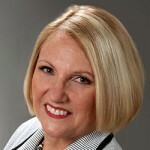 Becky Walzak is the president of rjbWalzak Consulting, www.rjbWalzak.com. She is an expert in loan quality assurance and risk management, with more than 30 years of experience in the financial services industry. She advises lenders and servicers on regulatory compliance matters as well. Becky developed the Walzak Risk Analysis Process Score (WRAPS), a fully automated quality control review for mortgage loan files, and the REO Performance Evaluation Model, which measures and tracks the performance of REO (bank-owned properties) vendors in meeting contractual requirements and following operational procedures. There was an advertisement recently showing a thief breaking into a home just as a woman was driving past. Of course, she immediately called the police who then came and arrested the thief before he could get away with the stolen goods. The purpose of the advertisement was, of course, to promote awareness in neighborhoods in order to prevent crime. Unfortunately, not all crime is this easy to detect and much harder to report. Mortgage fraud is the perfect example. Mortgage fraud occurs when an individual, group or company takes money from a lending institution which is collateralized by real estate through the use of false information. It may be the tiniest of white lies or the largest of schemes. Regardless of the type or amount of information that is false, if the information provided to the lender is for the purpose of making a decision as to whether or not to lend money, it is mortgage fraud. Borrowing money from another lender and telling the mortgage company that it was your savings. Asking someone else to lend you money to put into your account until the bank has verified it. Asking your boss or someone in the company to falsify a verification of employment with a salary higher than what you make. Having a friend say you work for their company part-time when you don’t. Providing a set of false tax returns that shows your income as higher than it actually is. Hiding debt from the lender. Asking a friend that works at a bank to verify that you paid off a loan when in fact you hadn’t. Many times the borrower sees this type of “fib” as having little consequence and justify it as a means of getting the loan that they know they will repay, but it is in fact fraud. There is a paragraph at the end of the loan application form that borrowers must sign that spells this out and advises them of the consequences of committing this type of fraud. These consequences include penalties and fines as well as possible prison time. The second type of fraud is fraud for profit. Rather than benefiting the borrower, this type of fraud actually benefits those individuals that are external parties to the transaction. This typically includes loan officers, appraisers, title agents, brokers and individuals who participate in the transaction without having an actual interest in the property. Many times this type of fraud involves individuals who are unaware of the fraudulent nature of the transaction, but are looking to benefit financially. One example of this that many individuals were caught up in is that of a straw buyer transaction. In this scenario the individual wants to buy a house but they know they would not qualify for the loan. They seek out someone with good credit and persuade them to act as the buyer. The incentives for doing this may range from a cash payment for their personal information to some actual percentage of ownership. Often these applications involve falsifying the income and assets of the borrower as well as inflating the value of the property. Then at the closing the “straw buyer” signs the note and mortgage but the individual actually buying the house has committed to making the payments. This works fine as long as the actual buyer can make the payments, or the house is rented. In a housing market where prices are increasing, the property may only be held for 6 to 9 months before it is sold again for a profit. If the house is a rental and cannot be rented out, there is no cash flow to cover the mortgage payment. Unfortunately because the “straw buyer” has signed the note and mortgage, they are responsible for making those payments. 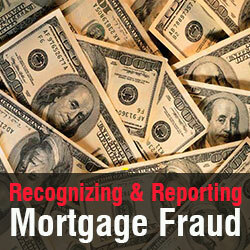 How do you report mortgage fraud? So what to do when you believe you have been unknowingly involved in mortgage fraud or know someone else who has been defrauded? One of the most difficult things about mortgage fraud is knowing who to tell. It’s not like the thief breaking into a house. The police can’t just show up and arrest someone. Fortunately, there are resources for reporting these types of crimes. Mortgage lenders, including those that are not banks, are required to report any attempted fraud that occurs within their organization. This report, called a Suspicious Activity Report or SAR, is completed by the institution and sent to the Federal Financial Institution Examination Council (FFIEC). These reports are then reviewed and the information is reported to the institution’s regulator. Individuals who believe they are aware of or inadvertently involved in mortgage fraud should report it directly to the lender so that they can take the necessary action and report the activity to the FFIEC. A more direct approach is to contact the FBI. Since the late 1990’s the FBI has maintained a specific task force focused on identifying and stopping mortgage fraud. You will be asked to supply information on the specific fraud or suspected fraud you are aware of or involved in and will most likely have to discuss the issues and your reasons for reporting it with an FBI agent. Consumers can also report this type of information to the Consumer Financial Protection Bureau (CFPB). This can be done on-line by going to their web-site, CFPB.gov and filling out the information requested in the consumer complaint section of the site. This information will then be reported to the lender involved as well as notification to regulators and the FBI. Finally, you can also report it to your local police. While they are not as involved and knowledgeable about this crime, they are becoming more and more involved. However, the incident would most likely be the responsibility of detectives’ rather just police officers. Remember, mortgage fraud is a crime that impacts everyone. This type of criminal activity causes property values to decrease and/or artificially inflate. Even the most honest homebuyer can become a victim simply because they have borrowed against their property’s value which is based on values pushed by mortgage fraudsters. Furthermore, these activities are frequently used as part of larger, more systemic crimes such as money laundering and other types of money transfers into and out of the country. Stopping mortgage fraud is not just an issue for mortgage lenders, it is everyone’s responsibility.